Crematogaster is an ecologically diverse genus of ants found worldwide, which are characterised by a distinctive heart-shaped gaster (abdomen), which gives them one of their common names, the Saint Valentine ant. 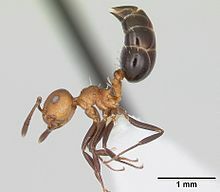 Members of this genus are also known as cocktail ants because of their habit of raising their abdomens when alarmed. Most species are arboreal. These ants are sometimes known as acrobat ants. Acrobat ants acquire food largely through predation of other insects, like wasps. They use venom to stun their prey and a complex trail-laying process to lead comrades to food sources. 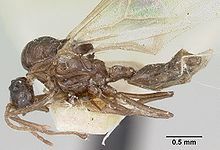 Like many social insects, they reproduce in nuptial flights and the queen stores sperm as she starts a new nest. Acrobat ants hunt both large and small prey. When it is time to hunt, foragers will typically recruit nearby ants to assist them. The ants can mark and detect their prey by specific contact. When they make contact, they immediately attack, sometimes releasing a small amount of venom with a sting. They also release an alarm pheromone to alert still more workers that prey has been seized. If other workers are present, the ants will "spread-eagle" the prey. When the prey is spread-eagled, all limbs are outstretched and it is carried along the backsides of the ants. The ants carry arolia, pad-like projections that are used to carry the prey back to the nest. These arolia are critical because acrobat ants are arboreal and will often need to travel up trees to return to their nesting location. If the prey is small and there is only one ant, it can carry the prey individually. If other workers are present, the ant will recruit carrying assistance, even if the prey is small. Acrobat ants typically eat grasshoppers, termites, wasps and other small insects. Acrobat ants are known to eat different types of wasps. Many of these wasps have mutualistic relationships with trees involving pollination. Additionally, the wasps typically have cycles which they follow, which can make it difficult for them to be located and captured by the ants. As a result, acrobat ants have evolved unique characteristics to detect the presence of prey. They have become sensitive to chemical signals that are released by wasps and use these signals as cues in the location of their prey. Acrobat ants can be found either outdoors or indoors with great frequency in each case. Outdoors, acrobat ants are usually arboreal, but they often live in many common areas in the wild. These areas are typically moist and are often dark. They can often be found in trees, collections of wood (like firewood), and under rocks. Indoors, nests have been found inside homes around electrical wires. These locations are often very near large food supplies and may be around other ant nests. As with many social ant species, in acrobat ants a queen mates with a single male during a nuptial flight. During this flight, the winged queen and winged male will mate, and the male will die shortly afterwards. The female will eventually land and remove her own wings, which she will no longer need. In these ant species, there is also a variation that exists to this mating strategy. There can exist large female workers that are smaller than winged queens yet larger than small workers. They also have many anatomical features that are intermediate to small workers and the queen, including ovary size and composition, and patches. These females can produce unfertilized eggs that can eventually develop into males in colonies that do not have a queen. If these eggs are produced in a colony with a queen, the queen can devour them. Larvae can also devour the eggs. Large workers will normally produce more eggs in ant colonies that are queenless. Large workers can be tended to by small workers in a similar manner to ant queens. "Large workers" have sizable implications for acrobat colonies. Given that large workers create eggs that can develop into functioning ants, they can actually create new colonies. They can also shift or shape the population dynamics of an ant colony that already exists. Also, for the large workers who produce these eggs, if they are eaten, this denotes a waste of energy on failed reproduction. Not all eusocial ant species have large workers, so acrobat ants are unique in this respect. Crematogaster ants "are able to raise their abdomen forward and over the thorax and head, which allows them to point their abdominal tip in nearly all directions." When in conflict, acrobat ants can release a venom by flexing their abdominal regions. The effectiveness of the venom varies greatly with the opposer to the ant. For example, some other ant species are not very resistant and can be killed with only a few drops, while other ant species and insects have a high degree of resistance to even large amounts of venom. However, the venom can often repel offending ants if it comes into contact with their antennae. Acrobat ants are typically not repelled by venom from other acrobat ants. The venom is created in a metapleural gland and usually consists of complex and simple phenols and carboxylic acids, some of which have known antibiotic properties. The ants apply froths to conflicting organisms. The froths are applied in a "paintbrush" style manner to surround the offender. "Frothing" has evolved independently in ants and grasshoppers. As with most eusocial insects, acrobat ants tend to form castes based on labor duties. This division is normally behavioral but also has a physical basis, including size or age. Soldiers are typically larger with a more developed metapleural gland specialized for colony defence or food acquisition. A worker ant is generally smaller than soldiers and queens, and its main task is to assist the queen in rearing the young. Workers vary in size more than soldiers. This considerable variation in size may have played a considerable role in the evolution of "large workers" in this genus. Acrobat ants participate in a form of mutualism called myrmecophytism. In this form of mutualism, plants provide shelter and secreted food, while the ants provide the plants with protection from individuals that might consume them. Many acrobat ants use plants such as Macaranga as their main source of food. The ants become alarmed when the plant is disturbed. They quickly emerge from their plant shelter and become aggressive. This can be the case even when neighboring plants are under attack. They can also recruit other ants to help in their defense. Acrobat ants lay scent trails for many different reasons: communication, recruitment of workers, etc. The scents originate in the tibial gland and are secreted from the gaster of the ants. The gaster never actually touches the surface of what the ant is leaving the scent on. When laying a scent trail, the ants will typically lift their abdomen sharply upward then bend it forward. One practical use for trail laying is to mark the path toward food. The ants will often find a food source requiring them to make multiple trips to the nest or shelter. In order to keep track of space, a scent is useful. Another significant use of a scent is to recruit other workers. This is actually helpful in a number of scenarios. It can increase efficiency when a food source is located and needs to be brought back to the nest. It can also be helpful in recruiting assistance during an attack on one of the acrobat ants' plant shelters. ^ a b "Crematogaster". Integrated Taxonomic Information System. ^ Alex Wild (2007-07-21). "Crematogaster". Archived from the original on 2007-08-06. ^ a b Schatz, Bertrand, and Martine Hossaert-Mckey. "Interactions of the Ant Crematogaster Scutellaris with the Fig/fig Wasp Mutualism." Ecological Entomology 28.3 (2003): 359-68. Print. ^ Richard, Freddie. "Predatory Behavior in Dominant Arboreal Ant Species: The Case of Crematogaster Sp. (Hymenoptera: Formicidae) - Springer." Predatory Behavior in Dominant Arboreal Ant Species: The Case of Crematogaster Sp. (Hymenoptera: Formicidae) - Springer. N.p., 01 Mar. 2001. Web. 24 Oct. 2013. ^ Schatz, Bertrand, Marie-Charlotte Anstett, Welmoed Out, and Martine Hossaert-McKey. "Olfactive Detection of Fig Wasps as Prey by the Ant Crematogaster Scutellaris (Formicidae; Myrmicinae)." Naturwissenschaften 90.10 (2003): 456-59. Print. ^ Nauman, Jennifer S. "Acrobat Ants." : College of Agriculture, Forestry and Life Sciences : Clemson University : South Carolina. N.p., n.d. Web. 22 Nov. 2013. ^ Heinze, J., S. Foitzik, B. Oberstadt, O. Rüppell, and B. Hölldobler. "A Female Caste Specialized for the Production of Unfertilized Eggs in the Ant Crematogaster Smithi. "Naturwissenschaften 86.2 (1999): 93-95. Print. ^ Schulz, Stefan (7 January 2005). The Chemistry of Pheromones and Other Semiochemicals II. Springer Science & Business Media. p. 193. ISBN 9783540213086. ^ Marlier, J., Y. Quinet, and J. Debiseau. "Defensive Behaviour and Biological Activities of the Abdominal Secretion in the Ant Crematogaster Scutellaris (Hymenoptera: Myrmicinae)." Behavioural Processes 67.3 (2004): 427-40. Print. ^ Stapley, L. "Physical Worker Castes in Colonies of an Acacia-ant ( Crematogaster Nigriceps ) Correlated with an Intra-colonial Division of Defensive Behaviour." Insectes Sociaux46.2 (1999): 146-49. Print. ^ Peeters, Christian, Chung-Chee Lin, and Yves Quinet. "Evolution of a Soldier Caste Specialized to Lay Unfertilized Eggs in the Ant Genus Crematogaster (subgenus Orthocrema)." Elsevier 42 (201 a3): 257-64. Web. 10 Nov. 2013. ^ Inui, Yoko, and Takao Itioka. "Species-specific Leaf Volatile Compounds of Obligate Macaranga Myrmecophytes and Host-specific Aggressiveness of Symbiotic Crematogaster Ants." Journal of Chemical Ecology 33.11 (2007): 2054-063. Print. ^ Leuthold, R. H. "A Tibial Gland Scent-Trail Lying Behavior in Crematogaster." Psyche75.128 (1968): 233-48. Web. 20 Oct. 2013. <http://psyche.entclub.org/75/75-233.html>. This page was last edited on 18 November 2018, at 12:43 (UTC).